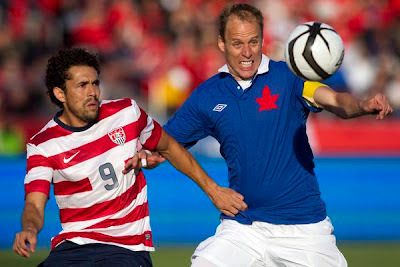 It was a friendly affair tonight at Toronto's BMO Field as the US national team tied 0-0 versus Canada. Few opportunities from either side and no real forwards making plays. From an American perspective this is both troubling and perplexing. Against Scotland, Klinsmann launched an all-out attack with a 4-3-3 formation devoid of Dempsey but with highly effective results: 5-1. Against Brazil this formula also worked and yielded the lone goal in a 1-4 loss but could have gotten a couple more if it weren't for the Brazilian defense. Tonight Klinsmann reverted to Bob Bradley's flat 4-4-2. A useful and sometimes powerful approach that can undermine the opposing squad's attack and can set up great play along the flanks to have 2 players in dangerous situations at all times. However, this only works if the flanks are mobile and overlapping. This did not happen with the US today. In previous matches a 4-1-2-2-1 formation, with Maurice Edu as a sweeper-like defensive midfielder, allowed Jermaine Jones and Michael Bradley to overlap in and out of the attack and maintained 3 players forward: Torres/Dempsey, Donovan, Boyd/Gomez. Tonight Jones and Bradley were static and unable to provide dangerous passes or to create spaces for Gomez and Dempsey while Donovan and Torres were double-marked into silence. It's always great to see changes in lineups and formations, but it's even better when one notices them on the pitch as the play is happening. This did not occur today until Klinsmann made the changes for Torres and Edu and reset the delta in the midfield. Although Brazil took advantage of 5 players going forward, the game was more enjoyable and gave the US the opportunity to do something special. It could also come down to the absence of a Fabian Johnson, a Danny Williams, a Timmy Chandler or even a Freddy Adu.